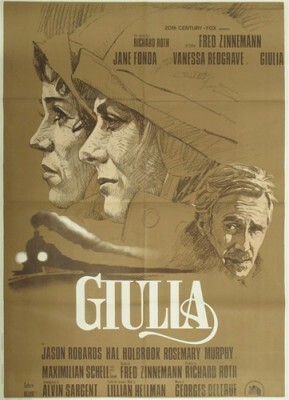 Directors and screenwriters working in film today could learn a thing or two watching Julia (1977), Fred Zinnemann's film about playwright Lillian Hellman and her relationships with novelist Dashiell Hammett and a luminous but enigmatic political activist named Julia. The film overflows with the kinds of things that have become extremely rare in Hollywood movies today: subtlety, unspoken emotion, ambiguity, and richly woven characterizations expressed with a minimum of action and dialogue. It's a very good example of how a particular time and its settings can be expressed without the use of epic but phony and overdone computer graphics. * It's also a great film from an underrated talent long overdue for a major retrospective. The film is a shadowy memoir told by Lillian Hellman (Jane Fonda), who was in her seventies at the time the film was released. The story freely moves from Hellman's early teenage years up to the ominous rise of Nazism in Germany. As a teenager Lillian spends summers with Julia (Vanessa Redgrave), who lives with her obscenely wealthy grandparents in cloistered opulence. Julia becomes politically active after a trip to Cairo where she was shocked by the poverty there - and appalled by her grandfather's advice at the human suffering before them: "Don't look at [it]." Julia, we learn in the limited exchanges Lillian has with her, eventually moves to Vienna and becomes involved with the anti-Fascist underground. Lillian, meanwhile, under Hammett's low-key guidance, writes The Children's Hour (though Alvin Sargent's superb script never mentions it by name), is fashionably liberal but profoundly naive, spending her days fretting over whether to use part of her royalties to buy a sable coat. When Julia is beaten near the point of death, Lillian races to be at her side. Eventually Lillian is tested when asked by Julia to help the cause. There have been two major complaints lodged against the film, one a misinterpretation of the movie's aim, the other quite beside the point. The later concerns the story's authenticity which, though billed in the trailer and elsewhere as a "true story," was almost certainly fabricated along the lines of James Frey's controversial A Million Little Pieces or appropriated from stories Hellman learned second-hand from the "real Julia," psychoanalyst Muriel Gardiner Buttinger, who shared the same lawyer. Ultimately, however, it doesn't really matter: whether real or not the story and its characters are grippingly effective. Some critics at the time (Roger Ebert to name one) seemed to think that the movie was about Julia (well, it is the title of the movie), or at least Julia's relationship with Lillian, and complained that the movie never really gets inside Julia's head. In fact the movie is told entirely from Hellman's point-of-view and is entirely about Hellman's search for identity and validation. She draws inspiration from both Hammett and Julia, yet by design is never fully connected to either one of them. It would be interesting to know just how much Redgrave is actually in the film, but it's probably less than 15 minutes in all. (She ended up winning the Academy Award over nominee Fonda anyway). The three leads share many obvious similarities with their characters; whether this helped their performances is unknown, though it probably helped some. Vanessa Redgrave was famously politically if not radical at the time. Incredibly, Faye Dunaway was first approached to play Julia, which probably would've been a disaster. Jane Fonda, like Hellmann in the mid-1930s, was working hard to be taken seriously as an artist and had, like Hellmann under Hammett, worked in the shadow of more respected mentor figures, from director Roger Vadim and then-popular politician Tom Hayden to her actor father. She was never better, though she followed this with equally fine work in Coming Home (1978) and The China Syndrome. Both Robards (who won the Best Supporting Actor Award) and Maximilian Schell, in a small but unforgettable role as an agent of the Underground, give superb and understated performances that tell the audience a lot about their characters with a minimum of action: little gestures, short bits of dialogue. One of the pleasures of the film in general and with Schell's character in particular is that it leaves many questions unanswered - it doesn't spell everything out in BOLDFACE the way big studios do today. The fates of several characters go unresolved, and better than just about any American film Julia addresses that haunting agony of not knowing what happened to people that have vanished from one's life. Near the end of the film there's a cut between two simple shots as unnerving as any horror film. Indeed, just about everything in this film works, from Douglas Slocombe's superb cinematography to Georges Delerue's haunting score, both nominated. Delerue's score is especially evocative. The film cost $7.8 million (fairly big money for 1977) but it's all up there on the screen. Director Fred Zinnemnn usually doesn't make the cut of great auteurs, but he should. His short but genre-varied list of credits include The Search (1947), Act of Violence (1948), High Noon (1952), From Here to Eternity (1953), Oklahoma! (1955), The Nun's Story (1959), A Man for All Seasons (1966), and The Day of the Jackal (1973). That's too impressive a filmography not to sit up and take notice. An earlier Fox-distributed DVD of Julia looked great, but this new Blu-ray really brings out Douglas Slocombe's cinematography, the use of lighting and color especially. His camera uses a lot of filters, which tend to look only soft in standard-def but take on a really beautiful texture in 1080p. Audio is DTS-HD Master Audio mono, with the film's score offered on a separate track. Limited to a 3,000-copy run, the disc is region-free. The primary supplement is an enlightening audio commentary with Jane Fonda, prompted with good questions by Nick Redman. Also included is a Trailer, complete with text and narration, which includes a single shot from a large scale battle sequence apparently shot but never used. Popular and acclaimed, but still somehow one of the great unsung films of the 1970s, Julia is a DVD Talk Collector Series title. *Basically, the film deemphasizes the '30s iconography (period automobiles, Nazi flags, etc.) to the point where they really seem part of the landscape and become more real. Sweeping CGI effects in movies cry out: "LOOK! Dazzling CGI!!!"